This recreation of a traditional souk is part of the massive Madinat Jumeirah resort. Its narrow alleyways and relaxing courtyards boast around 75 open-shuttered shops and galleries, a great selection of bars and restaurants, a nightclub and a theatre. Stores include Braschi (Italian fur coats), National Iranian Carpets (Persian carpets), Gallery One (photographic prints of Dubai), Pride of Kashmir (Kashmiri shawls, carpets, furnishings etc. ), Al Jaber Gallery (handicrafts, gifts, souvenirs, books etc. ), Persian Carpet House (carpets from Persian, Afghanistan, Pakistan and elsewhere), The Camel Company (toy camels and other souvenirs), Lata’s (souvenirs and jewellery), Cotton Club (lingerie), Early Learning Centre (educational toys), Havaianas (sandals), Sadek Music (guitars and musical instruments), Marina Exotic Home Interiors (designer furniture), and Rivoli (luxury watches – Tiffany and Co. etc.). The souk is fringed by numerous restaurants and bars. To the west, near the main entrance, there’s Honyaki (Japanese), Barzar (bar with live music) and Noodle House (Asian). The Pacha nightclub is also here. There’s also a cluster of places to eat and drink at the opposite end of the souk. Options include Anar (Persian), The Agency (wine bar), The Meat Co. (steakhouse), Trader Vic’s (international), Toscana (Italian), and Ushna (Indian). All of the restaurants and venues noted above are licensed to serve alcohol. 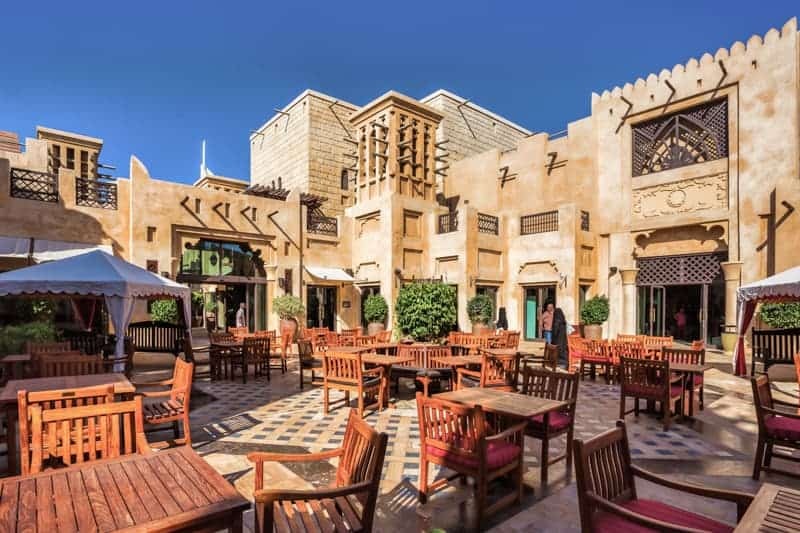 The First Group Theatre is a 442-seat performing arts venue at the heart of the Souk Madinat Jumeirah. It stages a wide range of shows ranging from musicals to film screenings. For details of what’s on visit the official First Group Theatre website. For a small fee visitors can also take a relaxing abra tour on the waterway that meanders around the resort. Tours run daily from 4 pm to 11 pm and depart every 20 minutes. 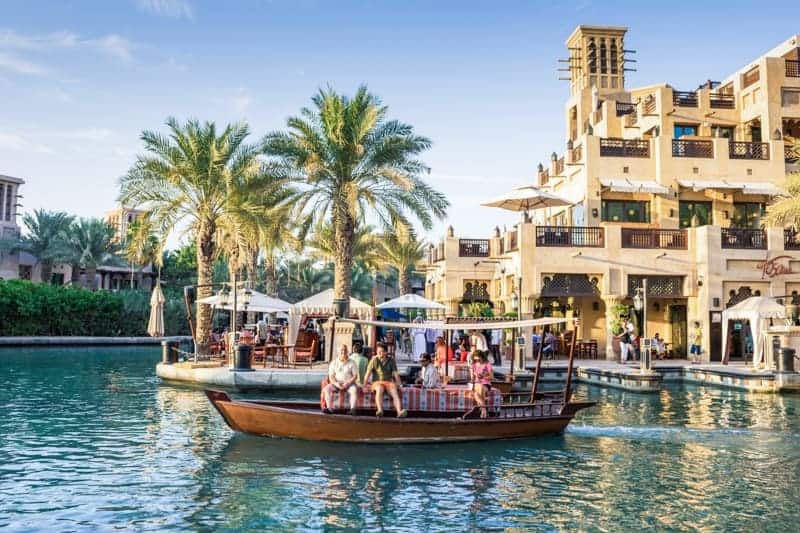 The Souk Madinat Jumeirah is open 7 days a week. Standard store opening hours are 10 am to 10 pm. Opening times for the bars and restaurants vary by venue. 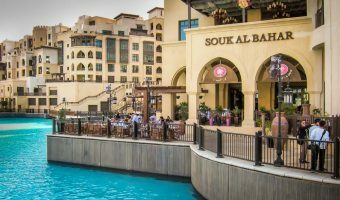 The Souk Madinat Jumeirah is located at the Madinat Jumeirah resort on Jumeirah Beach Road in Dubai. Free car parking is available. 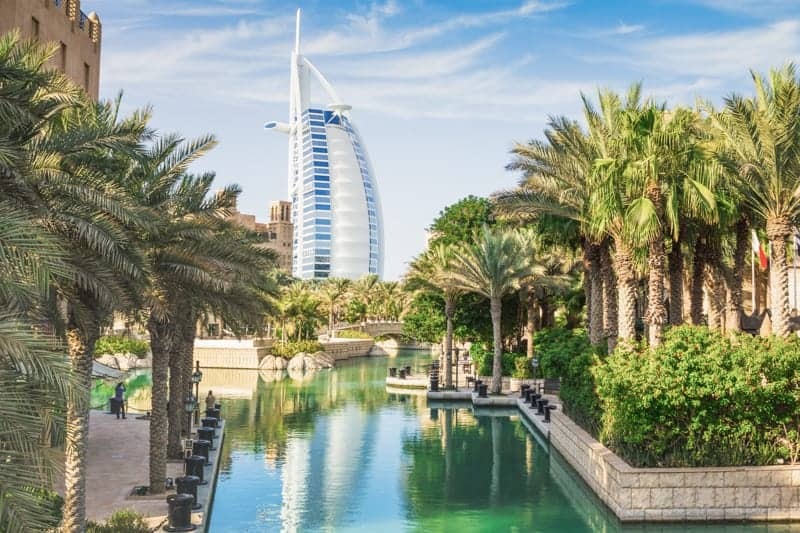 The nearest Metro station is the Mall of the Emirates Metro Station on the Red Line, approximately one mile from the Madinat Jumeirah. Map showing location of Souk Madinat Jumeirah. The Rivington Grill at the Souk Madinat Jumeirah will close for good tomorrow evening. The British restaurant will be replaced by a Jumeirah Restaurant Group Dubai brand in the final quarter of 2015. Pacha Dubai will open at the Souk Madinat Jumeirah on November 7, taking over the location previously occupied by the Trilogy nightclub. The souk is quite authentic even though I knew it was a fake. If you are looking for an authentic souk experience with all the haggling and everything that comes with it then this isn’t the place to come. If you want a pleasant time browsing without being hassled and want to see some nice architecture, have pleasant meals etc. then it is a good place. This is a very nice souk with a nice collection not only stores but places to eat and drink too. It would be quite interesting to visit it even if you don’t want to do any shopping. Jambase is not just a bar, it’s a pretty good place to eat too. I ate here last year and was very impressed. Very nice interior and a good atmosphere. 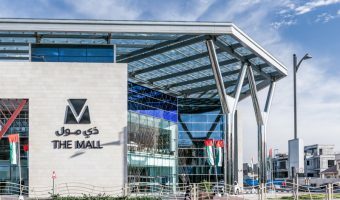 This is my favourite place to buy gifts in Dubai. The stores sell more unusual items than you’ll find in the larger malls. There’s also a lot of cafes and restaurants here for when you need a break.